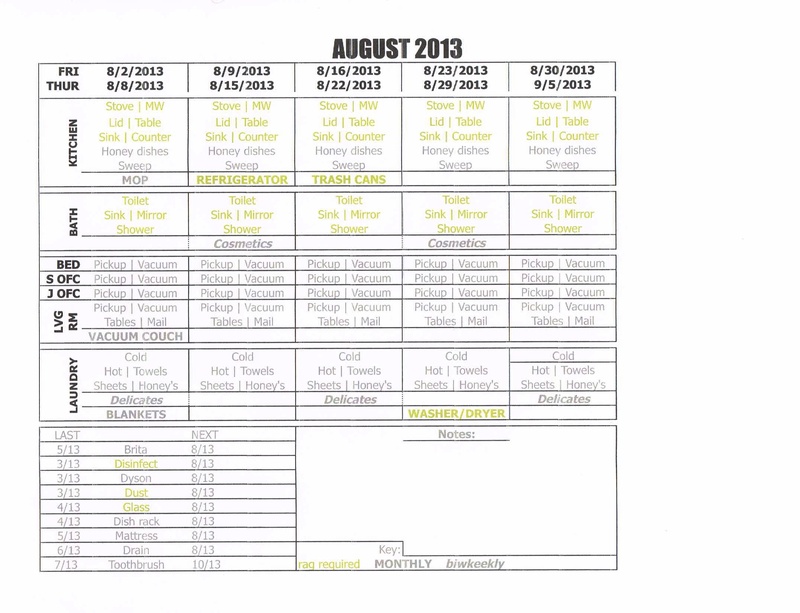 Updated cleaning chart for the month of August. I think it’s pretty self-explanatory; I even have legend at the bottom! I changed it so drastically because I decided I wanted to condense. There are so many things I do all at the same time, because they are near each other or involve the same cleaners. I wanted to put “vacuum” in every room because I always break that up. I do not do all the vacuuming at one time, rather, I pick up a room and then vacuum it. I also included the monthly items in the room section where they go. It’s more likely I’ll do them on time this way than if they were separated at the bottom like before. I’m excited about the color-coding and bold/italics to signify different things, rather than asterisks everywhere. Also – honestly, I haven’t been keeping up with the routine cleaning as much since I’ve had the house in uproar trying to declutter. Revising the cleaning chart and changing it so significantly was inspiring! This entry was posted in Cleaning, Organization and tagged clean, cleaning, cleaning chart, cleaning list, organize, organized, organizing, to do list. Bookmark the permalink.